Leslie Feist is eating a bean salad. That may not seem like especially earth-shattering news but, just 48 hours prior, the thought of consuming solid edibles would've made her retch. Literally: A tour stop in Istanbul last week left her with an unwanted souvenir -- food poisoning. "I passed out in the Munich airport," the Calgary-bred, Toronto-based singer says, enjoying her pre-show snack in a church basement that's serving as the artist-hospitality area for Rouyn-Noranda's annual Festival Musique Emergent (FME) event. "And then I woke up to an IV in my arm, and then I passed out again on the plane. "It's just so unfortunate, because it was a great tour and I loved Istanbul," she adds, before clarifying the culprit was not the Turkish cuisine. "I think it was the water. So many of us in the band -- like six or seven of us -- got sick, even though we didn't eat meals together. That all happened two days ago. But I bounced back -- I really appreciate basic things like health, and flavour right now!" Fortunately, for Feist, she'll soon be able to take solace in a home-cooked meal: following this past weekend's FME festival (read review) and the Daniel Lanois-curated Greenbelt Harvest Picnic in Dundas, Ontario, she's taking the show off the road after a solid year of touring her most recent release, 2011's Metals. It's move that's a product of circumstance as much as personal, battery-recharging necessity. "[The Harvest Picnic] is sort of our wrap-party -- we're calling it a day," Feist says of her current touring band, which includes fellow Broken Social Scene alumnus and Do Make Say Think bassist Charlies Spearin, Texas-based keyboardist Brian LeBarton, New Zealand-native drummer "Lucky" Paul Taylor and Vermont all-girl vocal-harmony trio Mountain Man. "This band and this configuration, they all signed on for a year," Feist explains. "Mountain Man were always an existing band, so it's time for them to crawl back into their own musical lives. Charlie is going to be doing stuff with [Broken Social Scene's] Kevin [Drew] again, and Do Make Say Think are having reunion shows, too, in the fall. I would be happy to play with this gang forever, but [stopping now] kind of makes sense. We all circumnavigated the globe like nine times this year. This record has had its time." Well, truth be told, there is actually a five-show South American jaunt on the schedule for October -- which Feist jokingly calls "the reunion tour" -- but she's approaching that more as a one-off vacation getaway than a continuation of her touring obligations. The recipient of three Juno Awards and a contender on this year's Polaris Prize short list, Metals may not have posted the same multi-platinum sales numbers as Feist's 2007 international breakthrough, The Reminder, but that was partially by design -- in that Feist had little desire to repeat the promotional rigmarole required to keep an album in heavy rotation. "People would say, 'Oh, it was four years between The Reminder and Metals'," she recounts. "Except I toured The Reminder for three of those years!" With its more insular mood and caustic sound (which made her recent collaboration with Mastodon seem a touch less unlikely), Metals may not be destined to go down as Feist's biggest seller, but it is arguably the most important album of her career: she may have shed a few casual fans who simply know her as the world's cheeriest iPod spokesperson, but the experience of touring the album this past year has shown her that the majority of her base is eager to follow her shifting musical course. "The Junos caught me so by surprise, because I had done things much more on my own terms," she says. "I maintained a reasonable amount of output in terms of promo; I had done a hell of a lot, but it was not nearly what The Reminder was. So to then be externally rewarded just caught me so by surprise. I hadn't exhausted myself to the degree that I felt was required. With The Reminder, I was so depleted, and I thought maybe that was what was required for that kind of external recognition. I was surprised that, with Metals, people didn't need a refresher on me. I thought there would be more of that 'Who is that again? Oh, yeah, right, her -- do we care anymore?' But there was an altruistic, benevolent opening of eyes. I don't want to assume that'll happen again, but I guess this tour has showed me that I don't need to operate from fear. Metals was a much more a human experience for me." And that would explain why Feist is winding down her world tour at a pair of small-town, community-oriented gatherings that are the anti-thesis of the corporate-branding exercises that define major summer music festivals. "Sometimes smaller shows are the more musical ones," she says, "where more synergy can be passed back and forth." Her Friday-night headlining appearance at FME's outdoor stage on 7ieme Rue was a prime example of this: performing the first time this year without her Mountain Man backing chorus, Feist instead called on the 2,000-strong crowd to act "like an elementary-school class" and fill in the harmonies on The Reminder's "Feel it All" and Metals lead single "How Come You Didn't Go There," or simply howl in unison at the evening's full moon. And if her once-ubiquitous single "1,2,3,4" was conspicuously absent from the setlist (as it has been for the entire tour), it was hardly missed either: though Feist treats her concerts as an opportunity to deconstruct well-worn material -- like a darker, tribal-percussive take on "Mushaboom," and a raw, foot-stomping "When I Was a Young Girl" -- she's constantly engaging the crowd to participate in the reinvention. "In music, there's always talk about [audience] growth, but I really don't think in those terms," she says. "Bigger shows can feel totally void of connectivity with music. I don't really strive to have anything get bigger, I just want to have something where it feels like I'm present, and actually exchange something with people who are at the show. Playing the Air Canada Centre really wasn't like that!" 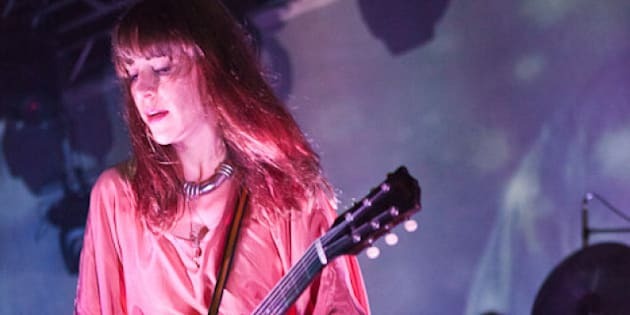 And where the disillusioning experience of tour hockey arenas for The Reminder necessitated a retreat and rethink, the afterglow Feist is feeling from her Metals journey suggests it won't be another four years before we hear new music from her. "When I stopped touring The Reminder, it was a little more extreme -- I was sort of collapsing at the finish line," she says. "Whereas this morning I was already combing through my voice memos [of song ideas] from this year. I'm constantly making them, and here I am driving to Quebec for our second-last show-quote-unquote-and I'm already curious about what might have already been planted. I'm allowing for any possibility. "I'm not in a rush, but I don't really feel the need to disappear again."